Iron Man and She-Hulk in Marvel’s “Hulk and the Agents of S.M.A.S.H.” on Marvel Universe on Disney XD. This Friday, “Avengers: Age of Ultron” hits theaters, and three new faces will join the team: the Scarlet Witch, Quicksilver and the Vision.1 These characters are Avengers mainstays in the comics, with a combined 146 years of involvement with the team, and are among the most prominent characters in the mainline Marvel comic book universe. So the obvious question becomes: Who’s next to join the Avengers squad in the Marvel cinematic universe (MCU)? A lot of familiar faces! We’ve got most of the squad from the movies here. 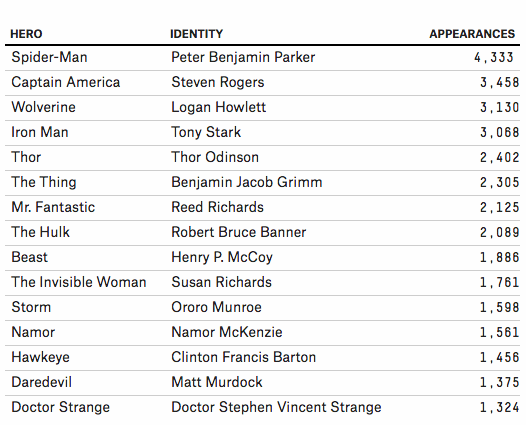 But this basic ranking isn’t a great way to tell who is likely to get a coveted Avengers membership card in the MCU. Many of these characters are already slated to have their own entries in the universe. Spider-Man, Doctor Strange, Ant-Man, Captain Marvel and Black Panther all have movies queued up between now and the end of 2019. Moreover, Marvel has a deal with Netflix to produce several MCU-based televisions shows. Daredevil already has a Netflix show, and Luke Cage and Iron Fist will soon follow on the small streaming screen. Maybe they’ll wind up on the big screen at some point. Then we get to Jennifer Walters, or She-Hulk, the attorney cousin of Bruce Banner. She-Hulk has been a presence in the Avengers since the early 1980s, and Marvel owns the rights to her entirely. She may be the next major addition to the MCU. What’s more, the She-Hulk just had an acclaimed run of her own in the comic books. In short: She-Hulk in 2020. I’m calling it. Let’s get a police procedural with She-Hulk working in the district attorney’s office. Or at least a cameo in Daredevil. Sure beats a Wonder Man movie, if you ask me. I have not seen this movie yet, so I don’t know if the fact that they’re introducing three longtime Avengers in an Avengers movie means that they will end up as members of the actual team. But I have a hunch? 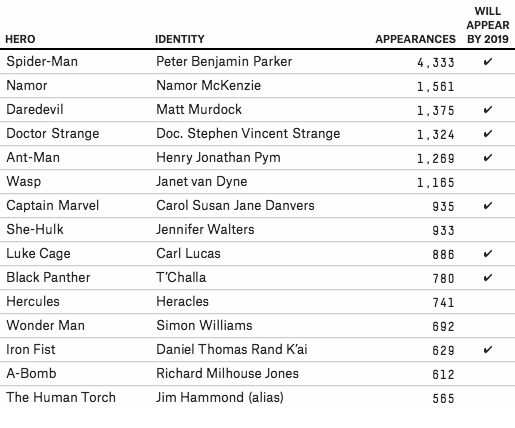 I used this data last year to gauge the diversity of the Marvel and DC comic book universes, and although “appearance count” is liable to change month-to-month as the characters, you know, appear in more stuff, it still seems to be a solid measure of how entrenched these characters are in comic book history. Not counting Dark, New Dark or Astonishing Avengers, because those are all generally bad guys and comics are weird. Spider-Man is complicated. Sony and Marvel reached a deal to include the web slinger in an MCU movie, but it’s not yet clear is what that means for villains associated with the character. As a result, I’m not counting Agent Venom as a plausible Avenger. Mild spoiler: Not seeing a credit for Janet on the IMDb page.